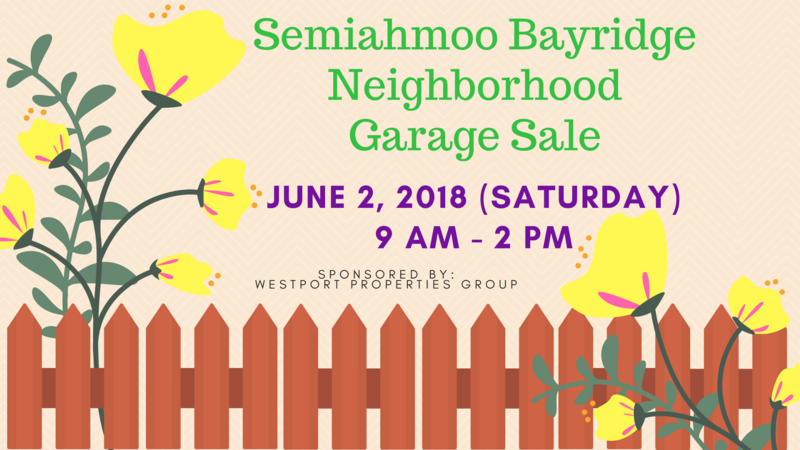 Westport Properties Group will be holding its Neighborhood Garage Sale at Semiahmoo-Bayridge in South Surrey on 2nd June 2018. We invite all households to participate in the event. We will take care of advertising, print materials and signages. All you have to do is to simply set-up the items that you will be putting up for sale. In order to join, please fill in the form below. It is important that you sign up on or before 30th May 2018 to be included in the printed map that will be distributed prior to the event. We will be printing advertising materials, showing a map of participating households in the neighborhood. Starting point will be at Bayridge Elementary School. We will advertise the sale to begin at 9 AM until 2 PM. We will be mailing you copies of the printed materials, which you can distribute to friends, colleagues and potential customers. Please encourage the attendees to get a copy of the map so it would be easier for them to locate participating households, especially those outside high traffic areas. This is a good opportunity for neighbors to come together because customers will love the convenience of visiting multiple garage sales happening in one area. The more participants we have, the better chance we have of selling items and making this event successful! We will have a prize event draw! To be eligible you must visit all garage sales and get all stamps on your map! Please refer to our Garage Tips to have a successful Garage Sale!